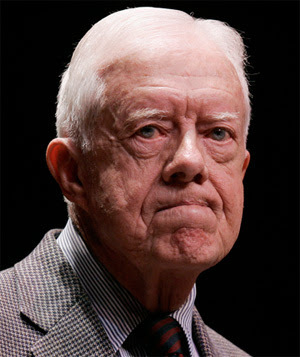 President Carter announced today that he was declaring war on Wall Street. That's fine. Go right ahead and propose whatever laws and regulations you want. They won't get passed, now that corporate money can flood into the system almost entirely unrestrained, and he's lost his veto-proof majority in the Senate. I forget who said it, a cable TV pundit I imagine, but somebody said a few months ago that if President Obama doesn't get health care reform passed he is going to go down in history as Jimmy Carter. The one-two punch Tuesday and today ensures it. It also means that financial reform is dead in the water. So the big banks can breathe easy. I have no idea why the market tanked today. I hope it wasn't the jawboning on banks. Ain't happening.